This investigation models osmosis using dialysis tubes that contain different concentrations of sucrose; the tubes will gain water dependent upon the molarity of solution they are placed in. 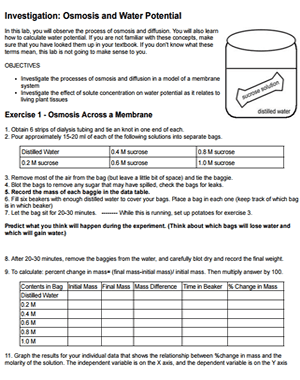 Sucrose solutions can be made using table sugar, and instructions are included in the teacher’s guide to the lab. The second part of the investigation determine the water potential of potato cells by soaking potato cylinders in each of the 5 solutions students have available. The potatoes will either gain or lose mass depending upon molar concentrations of sucrose within the potato, which students can discover by graphing the changes in mass and applying it to the solute potential formula. The final stage of the experiment is an inquiry investigation where students are given an unknown (one of the 5 solutions) in a test tube and must design an experiment to determine which solution they received. For this part of the experiment, simply remove the labels from the stock solutions and color code them with food coloring. Students can then conduct their experiment and make an educated guess regarding the molarity of their unknown. This is an advanced lab, intended for students in 2nd year, or Advanced Placement Biology.